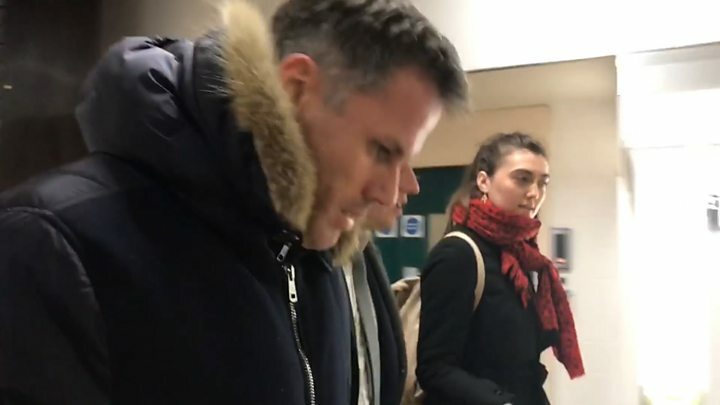 There's been outrage over a video of footballer turned TV pundit Jamie Carragher spitting towards a family in a car in an angry outburst in response to being "goaded". "Disgusting", "vile" and "doesn't get any lower than spitting" are among the comments posted about the video. To some people, spitting is in a class above everything - even violence. It's often seen as an action of anger and disrespect, but it hasn't always been the case. During the 1940s, when tuberculosis (TB) was widespread, it was common to see "spitting prohibited" signs on buses. Today the risk of catching a contagious disease if you're spat at is very low. Other diseases that are spread through saliva include TB, hepatitis, viral meningitis, cytomegalovirus - a common virus similar to the herpes virus - and the Epstein-Barr virus, which is a common herpes virus that causes many diseases such as glandular fever. On the football pitch, spitting on the ground is a common sight but spitting at your opponents is categorised as "violent behaviour" by world governing body Fifa. The police say "in most cases, spitting if done deliberately will be an assault" and they have started to introduce spit hoods to protect officers. The transparent mesh fabric hoods are used by 17 of the UK's 49 police forces. Councillor Chris Bond, who led the campaign to introduce it, described spitting as "utterly foul" and the "sort of disgusting behaviour" that "shouldn't be tolerated in a civilised society". "It is my belief that most people find spitting a wholly obnoxious, filthy habit which can spread germs and causes health issues," he said. "Banning spitting in Enfield will help combat tuberculosis which has been on the increase in London." In the same year, Waltham Forest Council in north-east London introduced fixed penalty notices of £80 for those caught spitting. It classified spitting as "waste", which meant that creating a by-law was not necessary and it successfully took two men to court. One campaign ahead of the 2008 Beijing Olympics saw volunteers handed out special "spit bags" and banners across the city urged people not to spit as a way of "improving manners". "Take part, contribute and enjoy yourself by welcoming the Olympics, being civilised and behaving better," said one slogan.